We offer Vacuum Tray Dryer to our clients. For Uniform Drying at Low Pressure. - The Construction is double walled, both walls made of CRCA Sheet. - Interior is painted with Heat Resistant Aluminum Paint to withstand long duration Heating cycles normally required in Industrial applications. - Exterior body either Powder coated OR Painted by long lasting Duco Paint. We are one of the largest Manufacturer and Exporter of GMP Vacuum Tray Dryer. 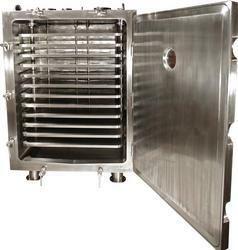 We are the leading manufacturer of highly durable and efficient range of Vacuum Tray Dryer. The range is available in box-shaped with loading and unloading facilities via a door. A number of heating plates are used to place products and goods. Is suitable for drying of thermal sensitive materials easily resolved, polymerized of deteriorated under high temperature. Sterilization can be conducted prior to the drying process during which no matter is allowed to enter the product.It is widely used in pharmaceutical, chemicals and foodstuff etc. We are offering Vacuum Tray Dryer to our clients. 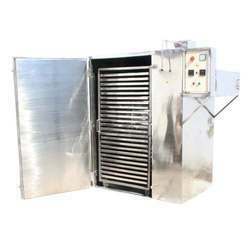 We are specialized in offering a precision engineered range of GMP Model Vacuum Tray Dryer. We take a huge pleasure in the market offering our clients with best Vacuum Tray Dryer.